The Burger 48 Cruiser will be delivered to her owner next year. It will be powered by twin 600-hp Volvo Penta D8-IPS800 engines. Wisconsin-based Burger Boat Co., known for building yachts between 76 and 214 feet, announced a custom 48-foot aluminum cruiser developed in conjunction with her owner and the Dutch company Vripack Naval Architects. Burger was commissioned to build the Burger 48 Cruiser by her owner, who has been working with the company and its partners to plan and design the yacht. At the same time Burger will be building a second 48-foot Cruiser, featuring interior design by Luis De Basto. The Burger 48 Cruiser will be built at the company’s shipyard in Manitowoc, Wis., and will be delivered to her owner next year. The second will be built concurrently and be available next summer. 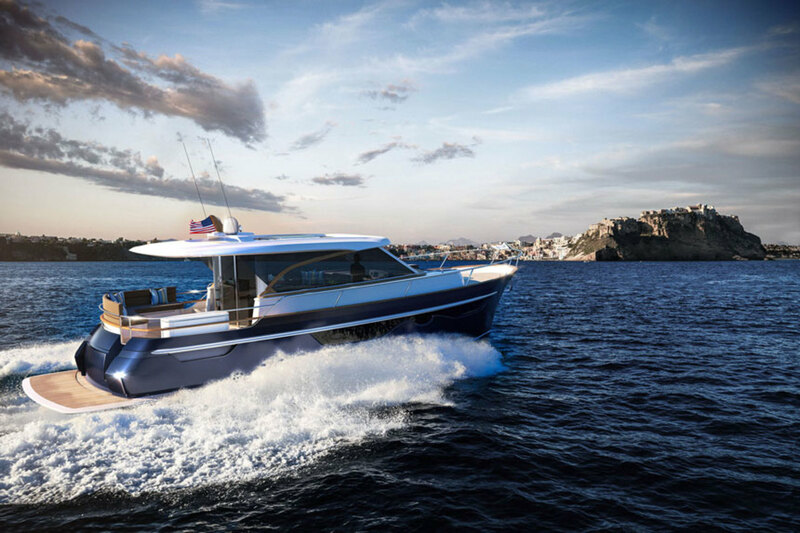 The Burger 48 Cruiser will be powered by twin 600-hp Volvo Penta D8-IPS800 engines and incorporates Vripack’s Slide hull design for cruising speeds of more than 40 knots and top speeds of about 35 knots. The Burger 48 Cruiser will feature two en-suite staterooms, unobstructed views in the open salon/galley area and exterior spaces for entertaining friends and family.